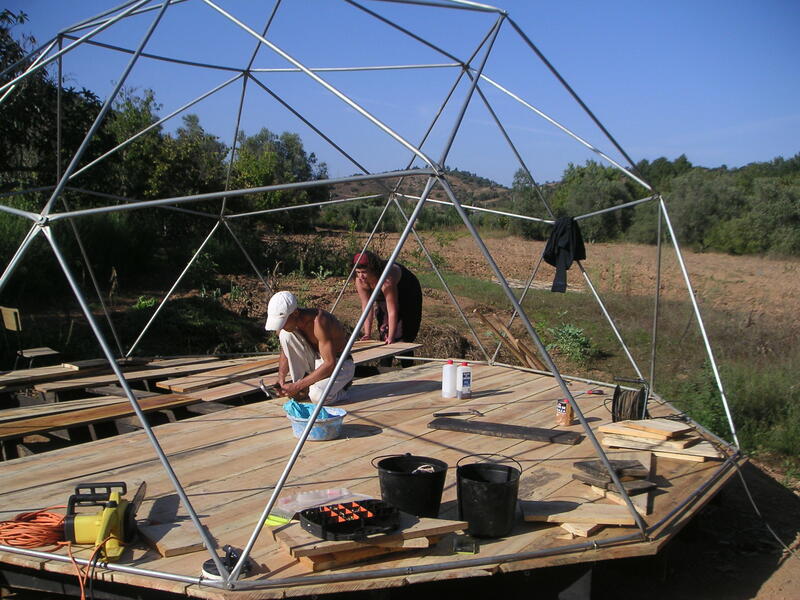 Dome construction step 4: Today we are dressing her, balloon style, by stapling semi-transparent agricultural foil to the edge of the deck and to wooden laths that we attached yesterday. Like with human dresses you need to make the rounded shape with folds. Nuno is on top of it all. After tasting his excellent soup today Bastiaan suggested to nominate him for volunteer-of-the-month to honor his many meritorious qualities. Xicca and I said goodbye today to four of our friends who are continuing their journeys. In the background you see something else that leaves from here by train. Eucalyptus trees, originally from Australia now cover 15% of Portugal. Large scale planting of these trees (mainly used for making wood pulp) dries up water resources and causes erosion and loss of biodiversity by offering a poor habitat for wildlife. You’ve seen it growing and here you see the last stage. For those who have not already guessed the reasons why we are making decks like this for our tents and domes: The wooden floors are elevated above the mud in winter and the dust in summer so we can store things inside trusting that they will remain clean and dry. We neither have to move earth for leveling the land nor dig ditches to drain the rain water. Maybe I shouldn’t tell you this but the Osho Garden experience is deeeeep. You already saw us yesterday jumping high after bumping deep. Today Peta was drilling deep. Our Australians are soon going to Holland to spend the winter there. They already learned to say some dutch words: Heel veel deep. Tonight I took this picture of our living room from a high standpoint to show how deeeep it is. Peta suggested to call it the deep room. I think it’s an Ooga Booga good name! I bet some of you don’t know what Ooga Booga is. Uhhh, it can be like bumping a stick in a hole. We did it in the garden dome with that big wooden hammer. But then it evolved into Emily’s new name. She took sannyas during lunchtime today and selected her own name but don’t worry, it’s just for today. Ooga Booga is also our new word for dome acrobatics. Look, you are invited to come over and give it a try! Surprise! Yesterday we took the barn roof down. 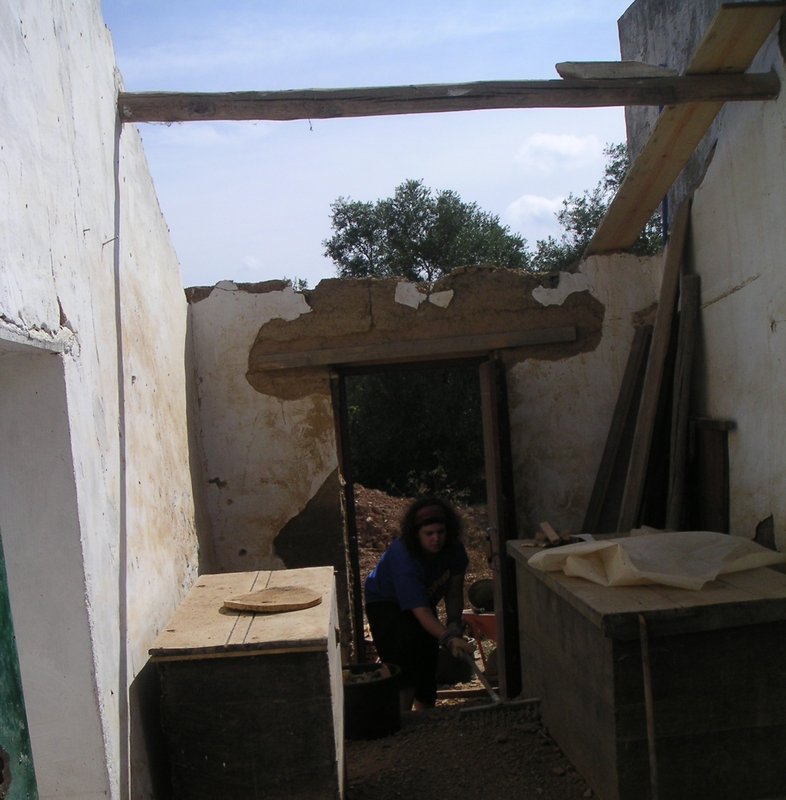 Well, to be honest we only assisted the builders who knew how to do this safely and who are now starting to reinforce the Taipa walls and renew the roof structure. This will give us a large surface for a solar collector and a warm and comfortable meditation space this winter. Today everyone is helping to clear the construction site, including the young architect in the picture. 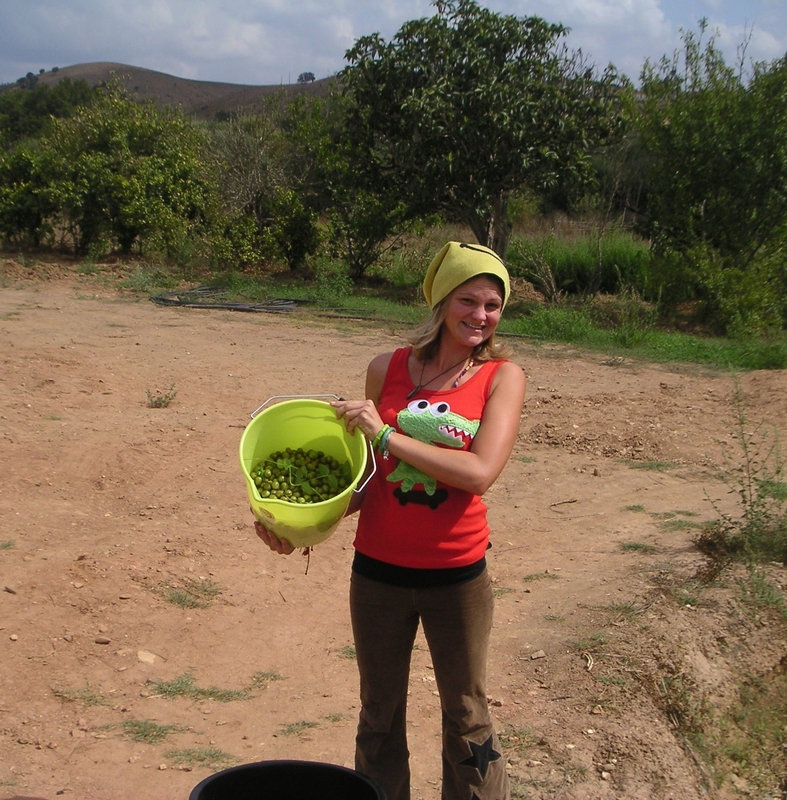 Tatiana is from Portugal but studied in Scotland and was looking for a nice project to join. Just the right timing for us. In Lisbon at the Festival we also had a meeting with Nuno and his twin sister Filipa. 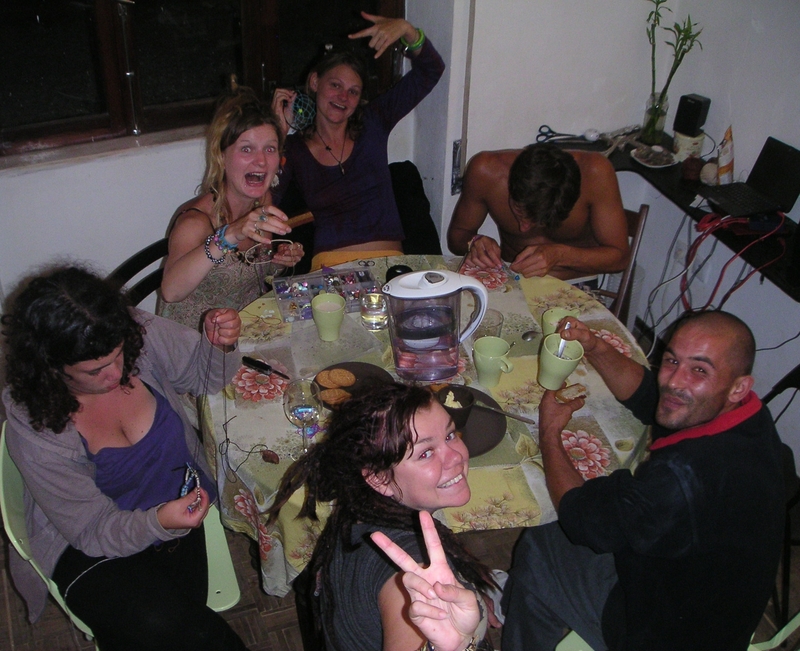 Nuno wants to join our community and do Permaculture. We think it is a good idea and he decided to join us when we returned to Sabóia yesterday night. 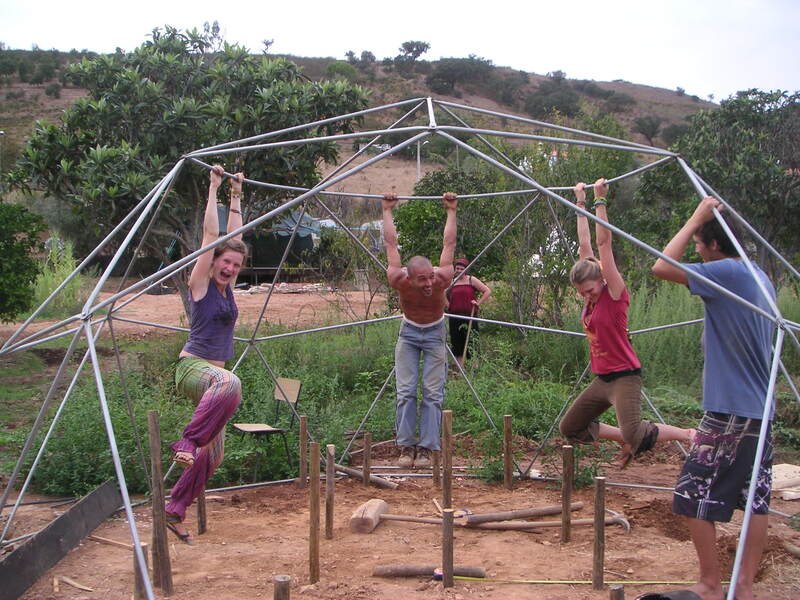 Today he is working with the water tank crew (without water no Permaculture, see?) and they are now applying an impermeable layer by the name of Superflex. Meanwhile Joke who arrived from Holland last week and Heather were trying to convince Lupo of the advantages of having a bath, and Peta was doing something similar with our olives. They need to be crushed, washed and marinated before they are edible.